Sarcodes couperosis serum contains a homeopathic amount of scorpion poison for a deep moisturizing and firming effect. No animals were harmed during the extraction of toxins. 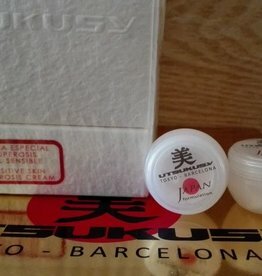 Utsukusy products are not tested on animals. Sarcodes Couperosis Cream for sensitive skin. Contains clover (stimulates blood circulation), green tea (anti-inflammatory) and grape seed oil (antioxidant effect). Deep moisturizing and protective effect. 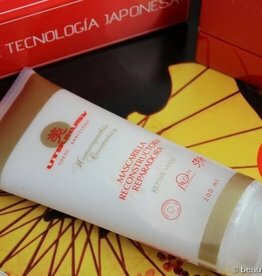 Is effective against rosacea. Improves the health of the skin and reduce redness. PROPYLENE GLYCOL, GLYCERIN, DIPEPTIDE DIAMINOBUTYROYL BENZYLAMIDE DIACETATE, HYDROLYZED COLLAGEN, AMINOBUTYRIC ACID, ALLANTOIN, SODIUM, HONDROITIN SULFATE, DISODIUM EDTA, CARBOMER, TRIETHANOLAMINE, PEG­40 HYDROGENATED CASTOR OIL, CERATONIA SILIQUA GUM (CAROB BEAN GUM), HYDROXYETHYLCELLULOSE, IMIDAZOLIDINYL UREA, CAPRYLYL GLYCOL, 1,2 ­ HEXANEDIOL, TROPOLONE, PARFUM (FRAGRANCE), BUTYLPHENYL METHYLPROPIONAL, LINALOOL, GERANIOL, CITRONELLOL. Dit is de beste creme tegen couperose. Ik heb verschillende merken geprobeerd, maar dan komen de rode haarvaatjes toch weer terug. Na experimenteren kom ik toch altijd weer terug bij Utsukusy. Ik koop de ene keer de set en de andere keer de losse creme. Heel tevreden, de salon is ook super, echte kwaliteit en super lieve dames! 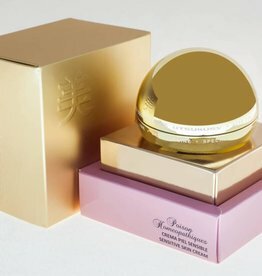 Couperose Cream Sensitive skin cream. Composition: Sweet clover (stimulates blood circulation), green tea (anti-inflammatory) and grape seed (anti-oxidative action).